Why do applications fly to the IPhone? Causes and solutions. How to enable modem mode on iPhone 6? How to disable the function "Find iPhone"? The mobile operating system iOS 9 came out on September 16 and a week after the release was installed on more than 50% compatible devices, despite forecasts that promised to reach this threshold only after almost a month. Undoubtedly, this can be considered another Apple record for the speed of transition to a new operating system. One of the reasons for the update on iOS 9 is the instability and clutter of its predecessor numbered iOS 8.4.1. A new standard Apple News app (US only). button to return to the previous application in the upper left corner. There are other changes in the new mobile system, but they did not affect the work with the new firmware so much and the average user will not notice these changes, so you can find out about them when you upgrade..
As you can see, the range of devices available for updating is very wide and even an old iPhone 4Sreleased in 2011, it supports it. All subsequent updates to iOS 10 (X), of course, will be supported by the same list of models. No matter how strongly we were convinced before that the company is diligently working on optimizing the new operating system, as well as on its tight testing, but the update process does not always work stably, sometimes an error occurs when switching to a new version. Many users furiously argued in the comments to the news about the release of the new iOS, that it is not stable, has many errors, works worse and even during the transition phase they hated this system because of update errors. Let's try to solve some of the frequent problems that readers have complained about, including an error when updating. Before updating, be sure to make a backup of the state of your device, you can save the backup via iTunes to your computer or to your iCloud cloud. After creating a copy, you can be calm, in case you do not like the new system or if an error occurs during the update, if it happens, you can restore the previous state of the device. 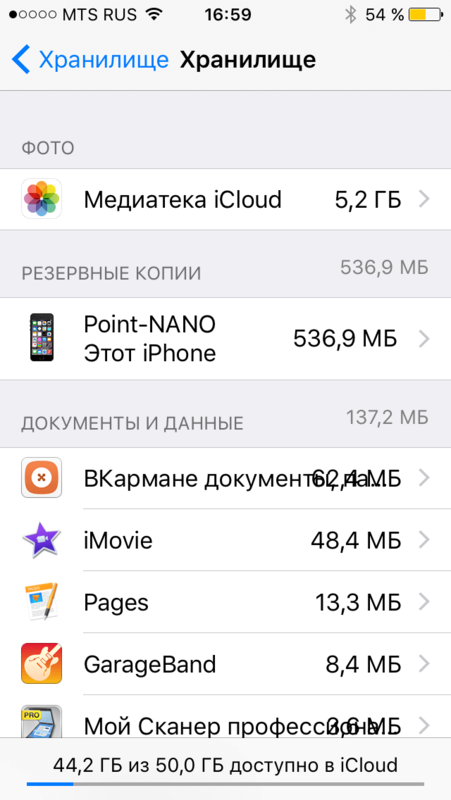 I would like to note that the prices for iCloud storage were recently lowered, and for 59 rubles you can now get as many 50Gb of free space on the cloud. Store all backups now you can on iCloud Drive and not worry about the fact that there is not enough space. The company has worked well on the system, and now it takes up much less space than its predecessor. When updating via iTunes, you will need the entire 600Mb of free space for installation, but do not worry, after installation you will happily find that there is more free space on your device! Whole 2Gb vs. 600Mb that were originally. The consequence of such positive turns is to optimize the work with the internal memory of the device.. When updating via Wi-Fi, many users encountered an error - a long update download error due to server congestion, it was simply solved. It was enough to connect your device to a computer and produce update via iTunes. Sometimes it hung up when requesting an update, in this case it was necessary to restart iTunes and reconnect your device, and the pause (error) when requesting the update server disappeared. Many were faced with interface hangs, which could not please. But the error went away by itself the day after use. The reason why there was an error in fitting the OS to a new environment / device, where it will work, creating new hashes, optimizing the work with memory and other things. For unknown reasons, the decision was not found by all users, so an additional option to eliminate the error, if it occurred, it is possible to read updates with a complete reset of settings and further recovery from a backup created after the update. This option helped all those who did not help the standard version, and who has the error remained. Another surprise was that in iOS 9 the charge began to be spent faster. This error is easily solved. The problem lies not only in the fact that users forgot to enable “Power Saving Mode”, which became available in the “Settings - Battery” menu, but also in that they forgot to disable some services. I would like to note that the new mode works excellently and it is worthwhile to turn it on all the time, even with 100% charge, since the functions that it turns off are not visible to the average user, and the time of active work increases significantly. Still remains the problem of long-term download of application updates and the appearance of a download error, which is associated with the restructuring of the App Store. The store configuration change was required due to the fact that a new function was announced, namely: individual updates and installation of applications. What is this for? As you know, recently, all developers were required to write their applications for all platforms that worked with iOS 8, which means that when installing on iPhone 4S, they pulled code from older models, but this additional code was not used and only occupied the internal memory. If this error occurred, the solution that was found in the new store configuration will help you. : installation after compiling only that part of the code that works directly on this device. Thus, the internal memory will be cleared of unnecessary information that takes up space, which, undoubtedly, can be considered a joy for users of models with memory on 8 and 16 GB. After a series of tests on loading the 9 OS and using a number of standard applications, a lower speed was detected on it than on the 8.4.1 release.. This is contrary to the words that we heard in the release that the operating system will become not only more stable, but also faster on older devices, including the iPhone 4S. If you were able to upgrade without problems, but faced with errors in the work, then together with you we will wait for the elimination of errors in future updates, as well as the promised optimization and performance for older iPhone models. Corrected App Store with the declared functionality for individual downloading of applications would also be a plus in the company's money box, because we love the company and are ready to forgive it a lot, but we pay for quality and every user hopes for it. Therefore, we wish a speedy correction of problems and release of iOS 9.1. Cellular data with manual APN configuration is now not lost. Cases are not uncommon, and they are associated not only with iOS 9, when the iPhone may show the wrong current time.